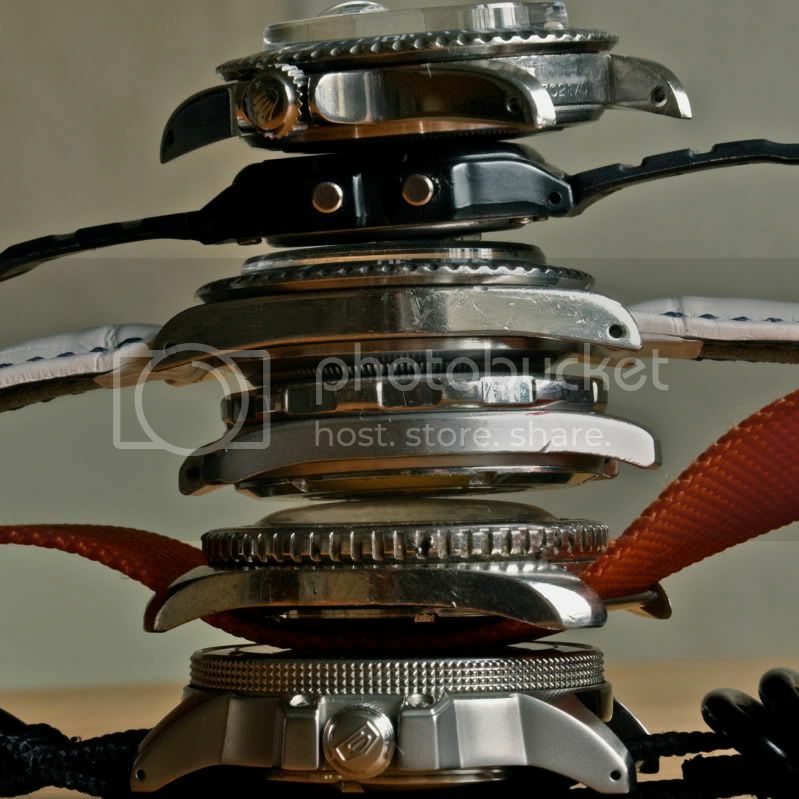 Discussion in 'Other Watch Brands' started by Neptune's Lair, Jul 19, 2010. Hi, I just got a Seiko SKZ211K1 "Atlas" or "Land shark" from a trade and wanted to share my very first impressions. Anyway, I had been back home for about a month and had almost forgot about the blue Citizen and Japanese watches in general when I stumbled across a Seiko Atlas the other week. I was very hesitant at first since I prefer cleaner and simpler divers. The Atlas got some sort of Gadgety McGiver compass inside bezel which is maneuvered by an oversized crown on the west side of the watch. The unidirectional divers bezel have numbers, from 5 to 60, in the same font as the compass bezel and the numerals at the dial indicating time. This makes everything kind of cluttered at 02:51 PM in the morning. However, I do appreciate the robust feeling and look of the brushed case and the easily turned diver's bezel. It feels like the Atlas gives a lot of bang for the bucks, or rather the tiny bit more prestigious 70s manual chronograph I traded in for this Atlas. What I love about this watch is the thick and dark yellow/orange hands which reeks of (my conception of) Japanese design language. 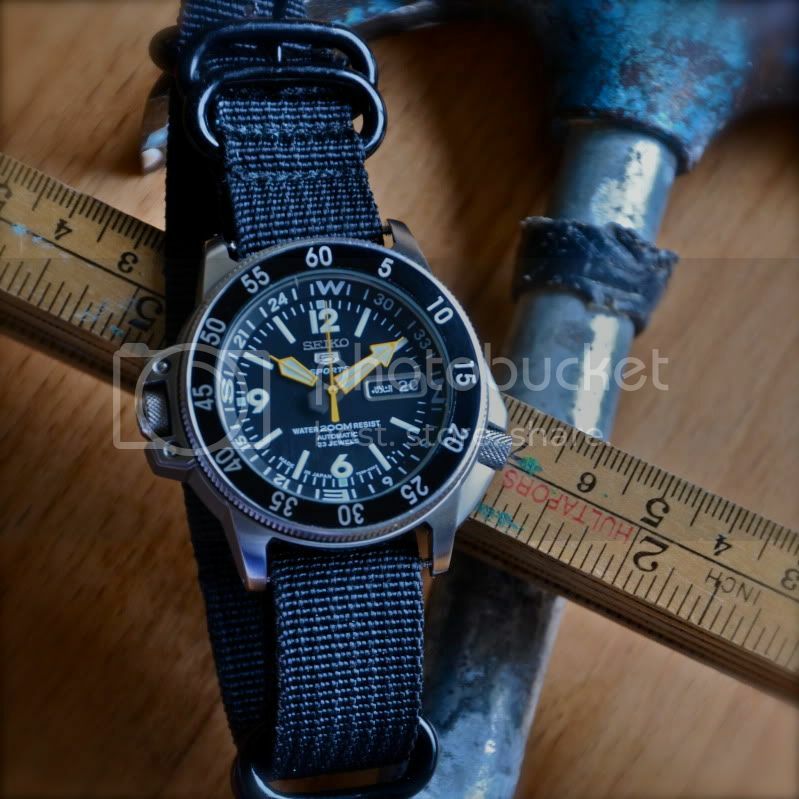 The thick comic book arrow kind of hands of some Japanese divers are probably what i like most about these watches. Besides, I've endured scrap metal powdered with obsolete tritium for about a year of so now the fact that these hands are covered with plenty of Superlumionova or Luminova or whatever it is that lights up the bathroom when the light is of is a plus. The fact that the watch got date and day function with the day written in both English and Arabic is another amusement. The non-hacking but quick set Cal.7S36 movement is probably nothing to write home about but it is used in many Seiko watches and seems to do its job. 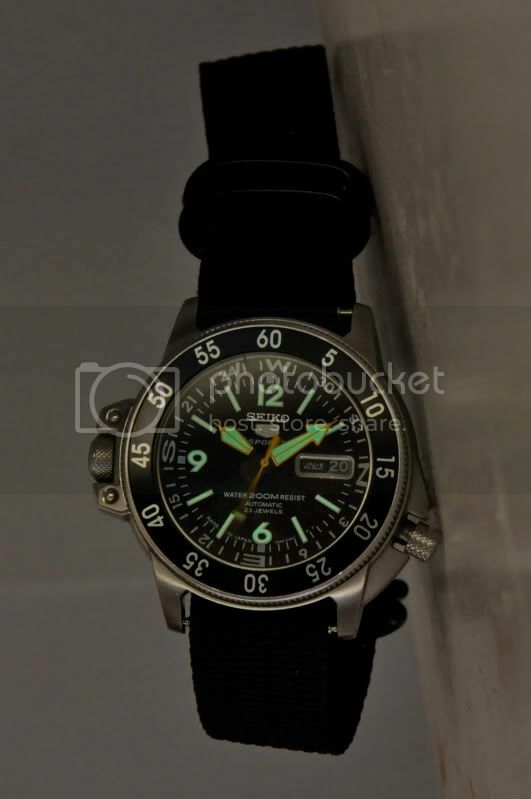 The watch is water resistent to 200 m. It came with a Seiko "oyster" bracelet but even though the quality seems fine I've mounted a (20 mm) black Nato instead. 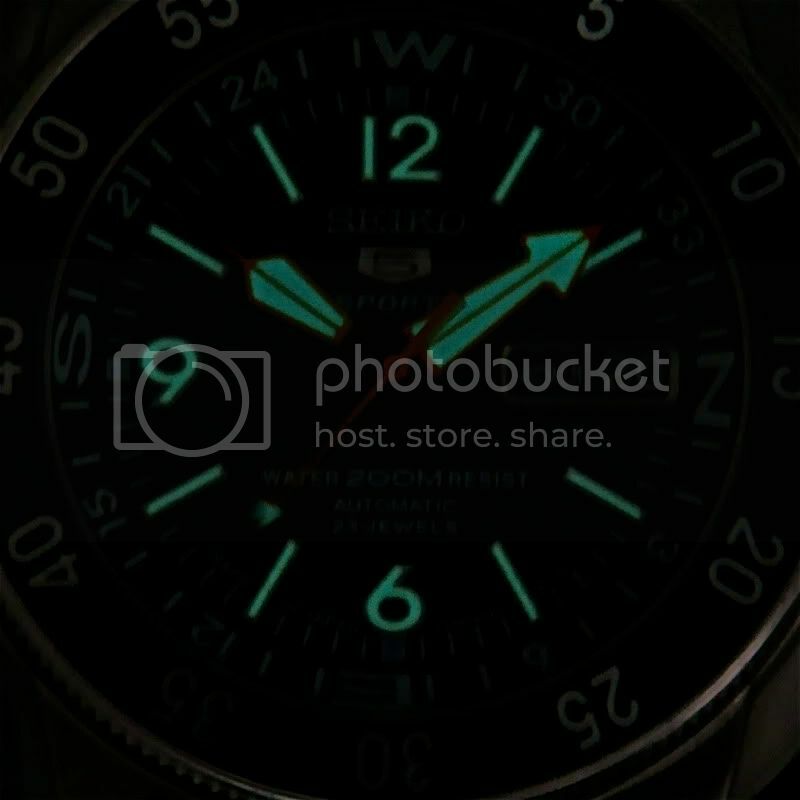 The first good impressions of this watch makes me ponder about the possibility of trying more high-end Seiko Divers such as the Sumo or even the Marinmaster which look so damn good on pictures. The only thing against this idea is the size. The Atlas, and I believe the Sumo and perhaps the Marinemaster, are something like 44 mm without crown and 22 between the lugs. For my tiny girlish wrists, that's just not ideal. For people who feels that Submariners are kind of small this is of course not a problem. Thanks for reading! If you managed to go through this wall of text I'm sure you can manage to find your way in the forest without the Seiko "compass". But for the price it's a nice toy that oozes quality and Japanese design language. It will do well as a summer, sport, reshuffle the attic, fiddle about with mens kind of pursuits kind of watch. Here's My Review Of The Seiko..
My nephew has it now since he was liking it so much that I gave it to him as a gift. That's a very nice gift! Good to know that the movement keeps time. Cheers Bo, I will! Feels like a great summer watch. Also, after having used it for a few days it doesn't seem to clumsy on my wrist despite its size. 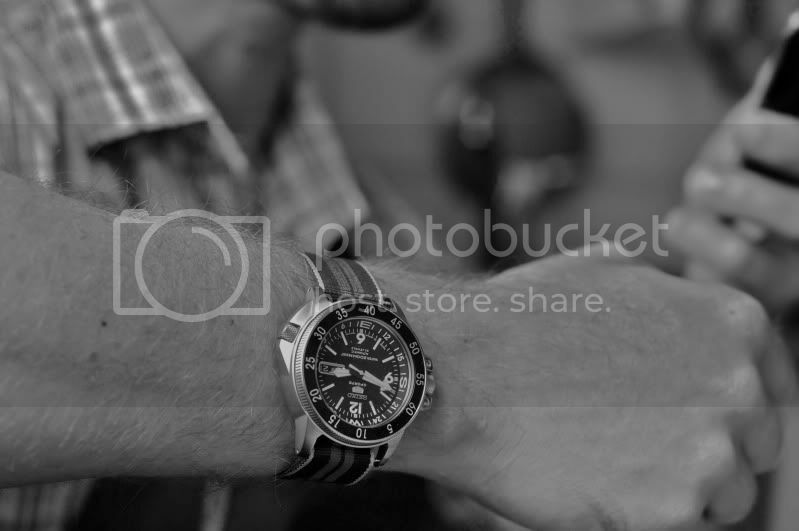 That's a great looking watch! Pity they don't sell 'em down here. That'd make a great back-up watch for me. If you don't mind me asking, what are they worth? One watch I'm really considering in the future is the slightly more expensive Seiko SBDC001 "Sumo" which IMO looks great and seems to have a great finish. The only really negative aspect is that they use mineral crystal rather than sapphire.